In the 1850s, a banging on a door marked the beginning of a seven-year saga that would end with a state defying the U.S. Supreme Court. That defiance continues to this day. Joshua Glover was playing cards in his single-room, dirt-floor cabin near the shore of Lake Michigan when he heard the ruckus outside. He yelled at his companions not to open the door when the insistent banging started, but it was too late. The door was flung open and three men charged into the room. One was armed with a gun. Glover resisted, but a second man cracked him over the head with a pair of cuffs, and Glover fell to his dirt floor, bleeding profusely. The men drug him out of his home, threw him roughly into a wagon and spirited him away toward Milwaukee. Under federal law, this kidnapping was perfectly legal. The three men who rushed into Glover’s home that night were Deputy U.S. Marshal Charles C. Cotton, a deputy marshal by the last name Kearney and Bennami Stone Garland. Garland had in his possession an arrest warrant signed by federal judge Andrew G. Miller based on his ownership of Glover. Joshua was a fugitive slave. Several years earlier, he ran away from Garland’s farm near St. Louis. Under the Fugitive Slave Act of 1850, Garland had the absolute right to travel north and reclaim his “property.” Joshua didn’t even have the right to testify on his own behalf or present evidence to a court of law. The word of the “master” was sufficient to justify kidnapping under federal law. Anybody interfering was subject to arrest and prosecution. Many northerners refused to accept the federal edict. Among the defiant in Milwaukee was a newspaper editor by the name of Sherman Booth. He was a staunch abolitionist, and when he got word marshals had captured an accused fugitive in nearby Racine and locked him up in the Milwaukee jail, he sprang into action. By 2:30 between 3,000 and 5,000 people gathered in front of the courthouse building, also the site of the city jail. The crowd was far from a disorganized mob. In fact, the gathered masses elected representatives from each city ward and drafted resolutions. The gathering was essentially an impromptu political meeting. But the demands for Glover’s release fell on deaf ears. Many Milwaukeeans delivered, fiery speeches, including Booth. Ultimately, the crowd took matters into its own hands and broke Joshua out of the jail. Supporters rushed him away and took him to a safe house on the Underground Railroad. After a three week journey, Joshua stowed away on a steamer and found freedom in Canada. 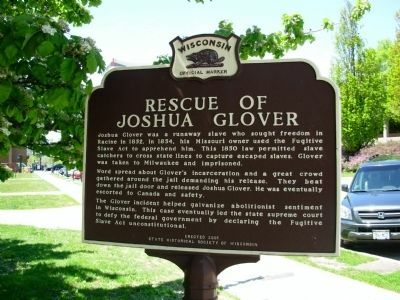 Booth helped Joshua Glover win his freedom. He would spend the next seven years fighting for his own. The feds arrested him and charged him with aiding a fugitive slave. Booth was released on bail, but two months later, he intentionally surrendered to federal marshals in order to bring the case before the court. A day after the surrender, Booth’s attorney, Byron Paine, applied to Wisconsin Supreme Court Justice Abram D. Smith for a writ of habeas corpus. Paine used Thomas Jefferson’s reasoning from the Kentucky Resolutions of 1798, arguing that the state has a sovereign right to assert its authority when the federal government violates the Constitution. He held that the Fugitive Slave Act of 1850 was unconstitutional because it denied due process and vested judicial authority in court commissioners. Smith agreed, ruled the Fugitive Slave Act unconstitutional and ordered Booth released. The federal government appealed the decision to the full Wisconsin Supreme Court, holding that the state court had no authority to release a federal prisoner and that it was the duty of federal judges to determine the constitutionality of a federal act. Lawyers for the federal government also insisted that the Fugitive Slave Act was constitutional. On July 19, 1854, the Wisconsin Supreme Court unanimously upheld Smith’s decision to release Booth. Chief Justice Edward V. Whiton and Smith declared the 1850 law unconstitutional. Justice Samuel Crawford wrote a concurrent opinion finding Booth’s writ of commitment to be invalid but the Fugitive Slave Act constitutional. A short time later, a federal grand jury indicted Booth. This time, the Wisconsin Supreme Court refused to issue a writ of habeas corpus, asserting that since the case was under federal jurisdiction, it could not intercede until after it was tried. A jury found Booth guilty, sentenced him to one month in jail and fined him $1,000. After his conviction, the Wisconsin Supreme Court issued a writ of habeas corpus and ordered Booth released again, after concluding it could consider the jurisdictional issue. When U.S. Attorney General Kaleb Kushing appealed the Wisconsin Supreme Court rulings to the U.S. Supreme Court, the Wisconsin justices refused to send a response, delaying the case for nearly two years. An historical document published by the Wisconsin courts described the effect of the Wisconsin Supreme Court’s refusal to comply. 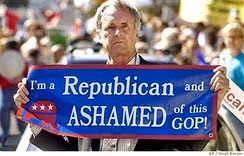 The Court’s action in refusing to make a return to the writ of error issued by the U.S. Supreme Court was tantamount to judicial nullification of part of the 1789 federal act which by that time had served as the basis for federal review of almost 200 cases. When the Supreme Court finally heard the case, it unanimously overturned the Wisconsin Decisions. Chief Justice Roger Taney (of Dred Scott fame) affirmed the constitutionality of the U.S. Supreme Court’s appellate authority and declared the Fugitive Slave Act of 1850 constitutional. A short time later, the Wisconsin legislature passed a series of resolutions condemning the U.S. Supreme Court decision. We regard the action of the Supreme Court of the United States, in assuming jurisdiction in the case before mentioned, as an arbitrary act of power, unauthorized by the Constitution, and virtually superseding the benefit of the writ of habeas corpus and prostrating the rights and liberties of the people at the foot of unlimited power. Resolved, That this assumption of jurisdiction by the federal judiciary, in the said case, and without process, is an act of undelegated power, and therefore without authority, void, and of no force.